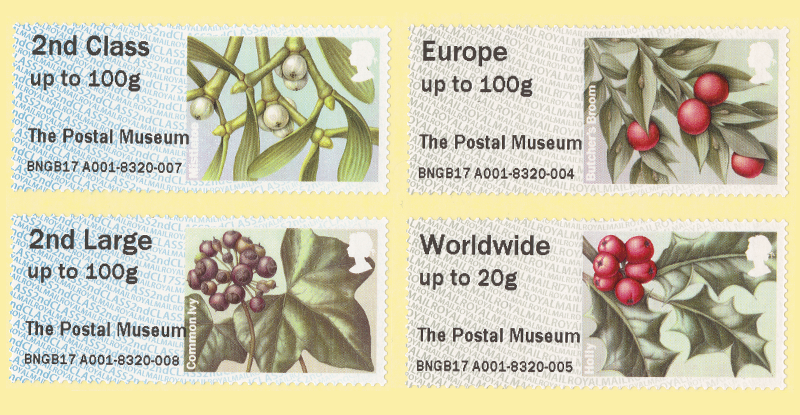 The Royal Mail Post & Go stamps featuring Winter Greenery designs will be available from its Post & Go machine from 8 November 2018, not 12 November as reported elsewhere. The stamps will replace the Machin 1st and 2nd class designs with the ‘F’ Box 50 overprint and feature four varieties of winter British flora, first issued in 2014. Butcher’s Broom and Holly can be seen on the 1st class designs and Common Ivy and Mistletoe are featured on the 2nd class designs. All designs with ‘The Postal Museum’ overprint are available until 31 December 2018. These images were originally captured by award-winning botanical artist, Julia Trickey in collaboration with designer Kate Stephens. Julia painted her vibrant watercolours of the featured plant species and background separately before merging them digitally. The Post & Go machine is available at The Postal Museum during normal opening hours. Please see our website for more information.